Le Cinema est tres magnifique!! Zut alors! 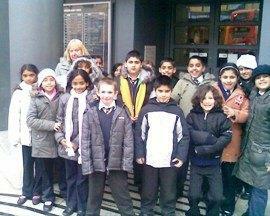 Le French Club went to the cinema avec Mme Relton et Monsieur Lait today to regarde 'Kirkou et la Sorciere'. The children really enjoyed it - especially when they thought they had really mastered the French language as they could understand every single word! Unfortunately for them the film had been shown in English by mistake - better luck next time French Club.